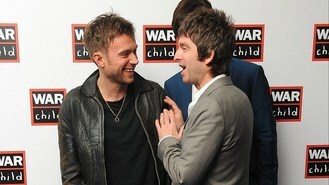 The former Blur frontman told NME that the pair have already discussed the idea of making music together "at least once". "I can imagine that being a very distinct possibility at some point in the future. But, as yet we haven't really talked about it, although," he said, before adding: "OK, we have a little bit. We're talking." Damon continued: "It's not anything to get excited about yet. I mean, he's doing his thing. He's finishing a new record. I've got my record coming out, but the principle of us making music together is something... You know, it would be fair to say, we have discussed it at least once." The duo, who were Britpop rivals in the 1990s with their bands Blur and Oasis, buried the hatchet after they performed together at London's Royal Albert Hall for a Teenage Cancer Trust gig in 2013. They were also photographed having a laugh backstage at the 2013 Brits. "I still see Noel from time to time. We text a bit," Damon said. Damon is set to release his debut solo album Everyday Robots on April 28, while Noel has been working on the High Flying Birds' second album.